UO Senate votes to end numerical teaching evals. Vote on ACP delayed. Info on contacting state legislators on budget crisis. After a presentation by Sierra Dawson (OtP), Lee Rumbarger (TEP), and a discussion with participation ranging from student senators on down to several unit heads responsible for instructor evaluation, and responses from the CIET committee members, and an amendment to require that the CIET report back on potential biases (w.r.s.t to women and minority instructors) after the new Student Experience Survey is in place, the Senate voted unanimously for the legislation below. It will end UO’s collection of numerical student evaluations starting in Fall, and in any case no later than next spring. So many people have worked so hard on this for so long. Thanks. In regard to the Academic Continuity Plan / Emergency Grades legislation, the vote was postponed for at least two weeks, in light of late breaking news that raised the possibility that the President might be legally entitled to overrule an Academic Council decision on emergency grades. Given this, President Schill suggested, and the Senate Pres (me) agreed that it would be best to give the GCO time to form an informed opinion on this, and then time for the Senate and its constituencies time to digest that opinion before a vote. Perhaps the policy will be amended, perhaps that will not be necessary. I hope that this will be accomplished in time for a vote a the 4/24 meeting. 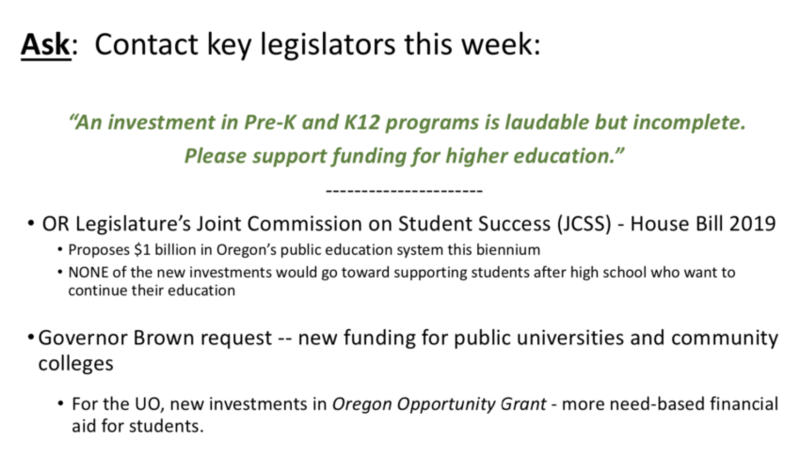 The Senate then adjourned, and VP Skowron and Melanie Muenzer (OtP) explained to the senators how they could contact key state legislators regarding key legislation that will affect UO’s budget, and tuition. Needs to be done by tomorrow. At ~4:00 PM: Discussion and Vote: US18/19-10: Academic Continuity Plan policy proposal(REDLINE and CLEAN drafts); Frances White (CoC). 5:00 PM Adjourn to Faculty Club, all invited! Tagged Senate. Bookmark the permalink. 2 Responses to UO Senate votes to end numerical teaching evals. Vote on ACP delayed. Info on contacting state legislators on budget crisis. The legislature already did their part. Faculty should instead contact those who promised money in exchange for forming the Board of Trustees. If you want more money from the Legislature, let’s also tell thrm to empower the HECC to have more authority over a Board not carrying weight consistent with the power they were granted. Begging the legislature by itself is just doing the donor Trustees dirty work while they collectively laugh and support the .5% offered GE’s.